Rodney King, a Los Angeles taxicab driver, became the catalyst for the second major urban uprising in the city in the 20th Century. On March 3, 1991 King was the victim of a brutal police beating that occurred in the San Fernando Valley of Los Angeles. Caught on tape by local witness George Holliday, the video showed four L.A. police officers restraining and repeatedly striking King with their batons while six other officers stood by, soon gained international notoriety as the beating was broadcast around the world. King was born in Sacramento, California in 1965, the year of the first Los Angeles Riot. He moved with his parents to Altadena, a Pasadena suburb, when he was 2. King’s parents cleaned offices and homes. His father, Roland King, died in his early 40s from pneumonia. The incident which catapulted King to international prominence began at 12:30 am on March 3, when a California Highway Patrol team attempted to pull King over for speeding. Driving at speeds up to 115 mph, King led the police on a 7.8 mile high speed chase. King finally pulled over at a dark park entrance, but did not cooperate with officers and displayed erratic behavior. Officers present recall King displaying symptoms of being under the influence of drugs or alcohol. King was shot twice with Taser stun darts, and then kicked and beaten with batons for eighty-one seconds before he was finally handcuffed. From the beating he suffered a broken cheekbone and multiple facial fractures, lacerations on the forehead, a fracture of the distal fibula in the right leg, and various bruises, contusions, and abrasions. That King was African-American and the Los Angeles Police Department officers were white, and that the LAPD had a long record of brutality especially against African Americans, added to the sensation of the case. Four LAPD officers were arrested and charged with assault and use of excessive force. At the request of the defense the trial was moved from downtown Los Angeles to suburban Simi Valley in neighboring Ventura County, where a predominately white jury without any African Americans was chosen. At the April 1992 trial, three of the officers were exonerated and another was acquitted of all but one charge. Announcement of the verdict spurred four days of rioting in Los Angeles beginning on April 29, 1992. A twenty-five-square block section of the city was torched. Fifty-four people died in the riots, two thousand were injured, and nearly ten thousand were arrested. More than eight hundred buildings were burned, and damage estimates neared a billion dollars. The riots also touched off similar outbursts in Las Vegas, Atlanta and other cities across the United States. The officers charged with beating King were then prosecuted federally for civil rights violations. Two of the officers, Sergeant Stacey Koon and Officer Laurence Powell, were convicted on April 17, 1993, and sentenced to thirty months in prison. 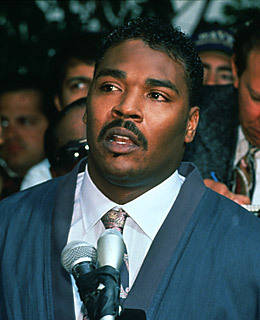 Rodney King was awarded $3.8 million in his lawsuit against the city of Los Angeles. Since the incident he experienced continued run-ins with the law, including convictions of drunk driving and spousal abuse. King died at his home in Rialto, California on June 17, 2012. He was 47. Lou Cannon, Official Negligence (New York: Random House 1997); Sergeant Stacey Koon, Presumed Guilty (Washington D.C.: Regnery Gateway 1992); Tom Owens, Lying Eyes (New York: Thunder’s Mouth Press 1994), Seattle Times, June 18, 2012.